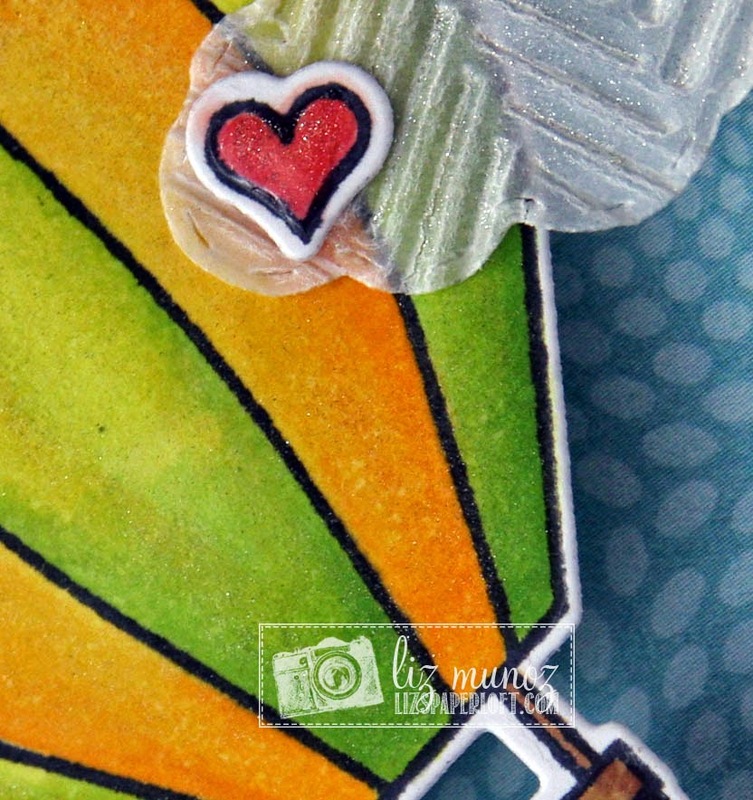 Liz's Paper Loft: MCT April Release Sneak Peek Day 3 ~ sending love! MCT April Release Sneak Peek Day 3 ~ sending love! Welcome to Day 3 sneak peeks of My Creative Time! Wasn't yesterday's projects FABULOUS!!! Today we are featuring Fun Stitched Clouds & the Sky is the Limit stamp and dies! So you're thinking this looks a bit familiar. 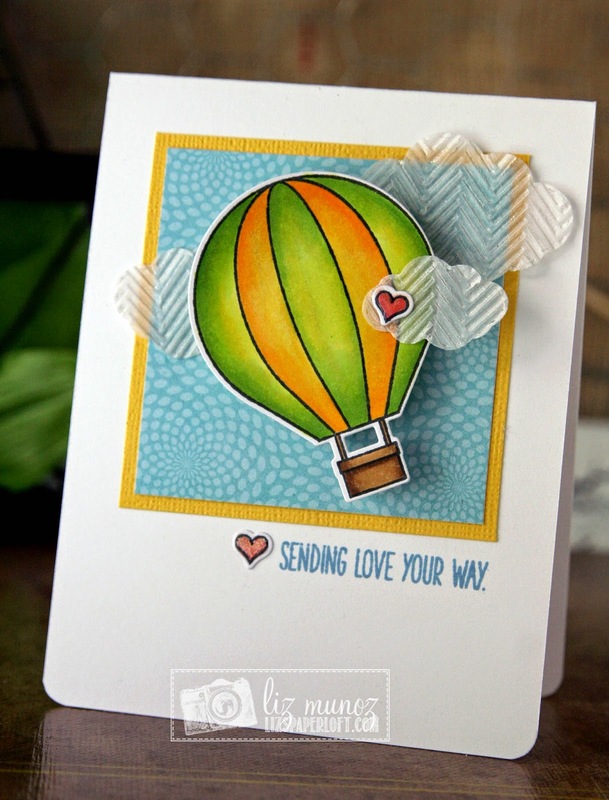 You're somewhat right :) Miss Emma has revamped the clouds and hot air balloon, and added some AWESOME new sentiments!!! After I die cut the vellum clouds, I added some texture to them by running them through my big shot with a Sizzix folder. The hearts were colored with copic markers, then wink of stella, and lastly glossy accents. This is a pretty card, very colorful. Wonderful card! Beautiful coloring! Your clouds are so fun and cute! I love how you have your balloon soaring in the sky. Love your idea for the vellum clouds definitely an amazing and awesome look. Love the colors of your balloon great job on the hearts too. YOU so ROCK!! What an AWESOME card Liz!!! LOVE the coloring of the balloon and those clouds~ SO AWESOME!!! What a sweet card! Fabulous coloring!! Liz your card is so pretty!! I love how you used vellum and then embossed it! It's a favorite set of mine so far! Awesome inspiration today! So pretty! I love the colors and your textured clouds! Fun card! 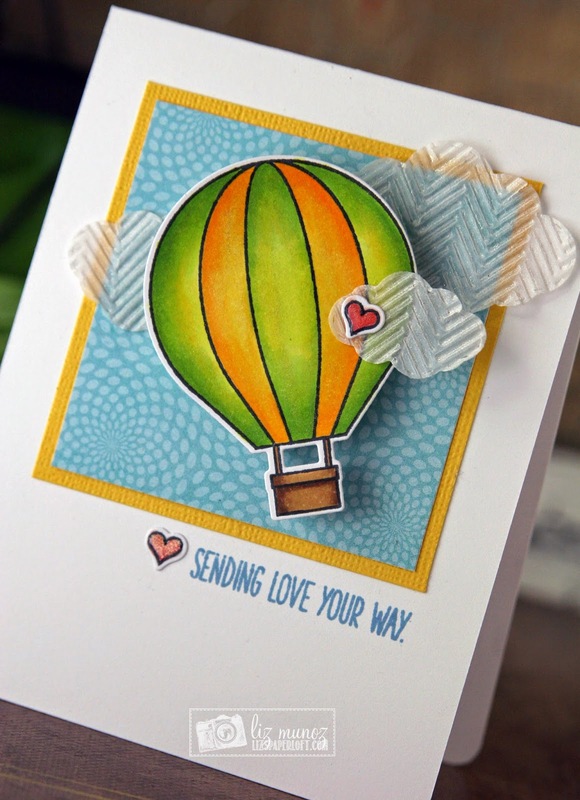 Love the coloring you did on the hot air balloon and the embossing on the clouds. This is adorable! I love the size of your layers, really makes the balloon the focal point! Very pretty card, love the extra touch to your clouds. Good Job!! Very pretty. I like the textured vellum clouds. Liz ~ oh this is just BEAUTIFUL! LOVE the way you colored the hot air balloon. Then your clouds ~ BEAUTIFULLY done! Just beautiful Liz. Love the velum clouds. Very very pretty. Beautiful card and I love the way you made the clouds with vellum. I LOVE this pretty card! Awesome background for your pretty balloon, and awesome clouds! Love the colors too! Love the colors on the balloon. The vellum clouds are a fun idea. That is a beautiful card! Such pretty colors. Simply beautiful!! I love all the wonderful details! Thank you for sharing. Fun card! Love the embossed clouds. I love the dimension your coloring gave the balloon...great job. I like the movement of the background paper and the texture. Beautiful job on your card. I like this revamped set. Eek! Love the texture on the vellum clouds! Great idea! Your card is PERFECT!!! :) I love, love, love how you did the clouds in velum and texturized them!!!! That hot air balloon came out gorgeous, that color combo is so pretty!